News from LMCU: Choose LMCU For Your Health Savings Account! Choose LMCU For Your Health Savings Account! 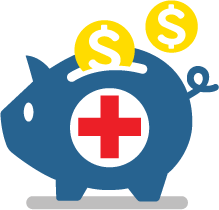 If you’re enrolled in a high deductible health insurance plan, Health Savings Accounts (HSAs) allow you to save toward future medical expenses tax-free. Unlike Flexible Spending Accounts (FSAs) there are no “spend it or lose it” requirements. LMCU’s Health Savings Account has some of the highest tiered interest rates available anywhere, no fees, a dedicated debit card, unlimited check writing, and easy 24/7/365 access to your account through LMCU’s Online Banking portal, or our mobile banking app. Contact us at (616) 234-6335 or IRA@LMCU.org to learn more to apply for your new Health Savings Account!